Official Miami FC home match jersey for the 2016 season. Miami FC official design by Macron. The Miami FC 2016 home jersey is turquoise, officially nautical aqua with a subtle stripes pattern on the front, with the collar and sleeves offset in orange. 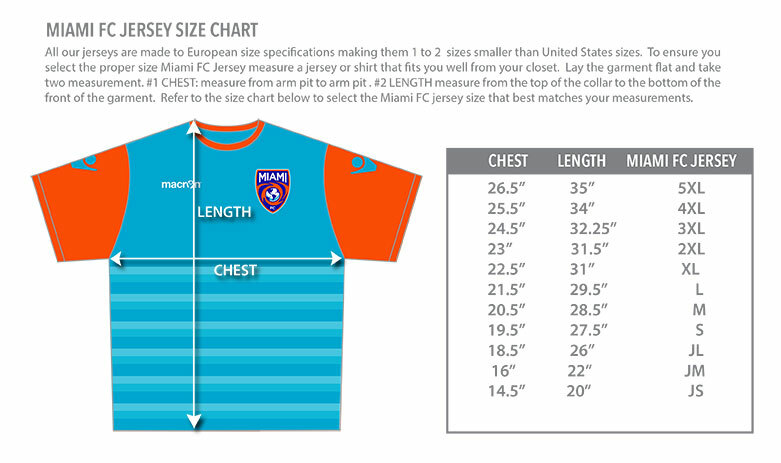 Official Miami FC jerseys are made to European size specifications making them 1 to 2 sizes smaller than United States sizes. To ensure you select the proper size Miami FC Jersey refer to the size chart below. Exchanging a jersey after purchase will be subject to a 10% restocking fee plus shipping. Jerseys with custom names and numbers will not be allowed to be returned.